I’m honestly not sure what to make of Raw Bean. They make a big thing about how coffee is best when it’s fresh, and so “we only roast our coffee once the order has been placed”. All very sensible stuff, but then they put their coffee into bags and sell it to Waitrose – the one I bought (in July) says it was roasted in April, clearly demonstrating that the whole “freshest possible” ethos isn’t compatible with supermarket supply chains. I did venture to their website to see if they had more to say, and perhaps see what other coffees they have in their range but it’s mostly the same tag line repeated across about six pages and nothing else. To be honest, it’s so devoid of content that they’d be better off without a site at all. So, it’s not exactly fresh and comes from a near-anonymous company – what does it taste like? 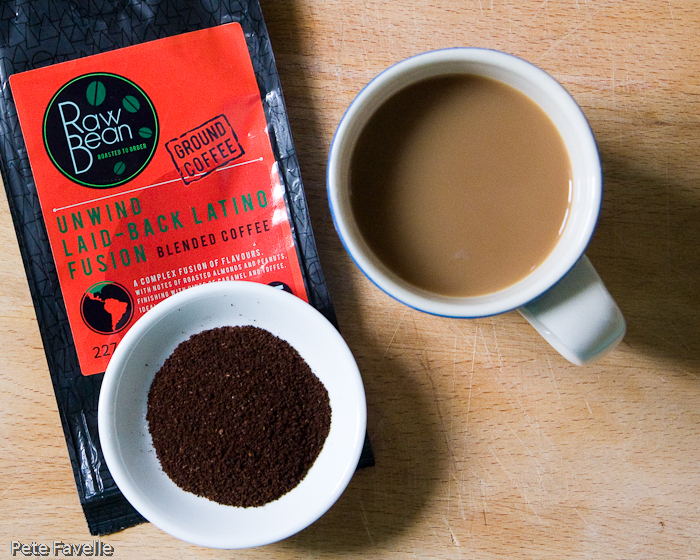 Unwind Laid-Back Latino Fusion is a blend of Latin American coffees (as well as being a mouthful to say!). The grounds are dark, with a slightly singed aroma – dark chocolate coated limes, with a background of bitter burnt sugar. Brewed, the burnt notes are lost and a richer, sweeter toffee character emerges. There’s still a chocolate dimension but it’s softer, more like milk chocolate and the lime is reduced to a subtle citrus acidity in the background. In the mouth the sweetness of the aroma is lost; there’s a drying acidity, with hints of tart cooking apples but for all the darkness of the roast, there is a lack of serious flavour. Overall a bit of a disappointment, although there isn’t anything fundamentally wrong with it. 2 stars.